Check brewery off the list of the city’s attractions. The Bent Water Brewing Co. held its grand opening Saturday on Commercial Street just off the Lynnway. The event featured tours of the facility, live music, local food and, yes, beer. Thanks to a $200,000 start-up loan by the Lynn Economic Development and Industrial Corp. Bent Water was able to get its start. Crowds gathered at the Bent Water Brewing Co. Blast Off celebration on Saturday for beer, food, music and a tour of the facilities. Managing partner Aaron Reames called the loan a “meaningful token of support,” and praised the EDIC for its early support. 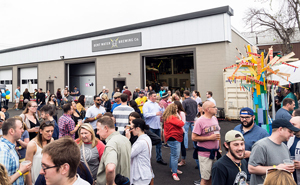 Reames, a Swampscott resident and financial manager at Columbia Threadneedle Investments, a Boston-based global asset management group, said he and Master Brewer John Strom considered sites in Marblehead and Swampscott while searching for potential brewery locations. But neither were a good fit. Reames said he made the decision to locate in Lynn after consulting with EDIC/Lynn Executive Director Jim Cowdell, and Nick Meninno of Meninno Construction in Lynn. “Lynn has fantastic water, and the city really embraced us,” Reames said. Formerly Lynn Lumber, Reames said he and Strom, along with managing partners and investors Chris Crawford and Michael Shaughnessy, lease the building from Meninno. Lynn Business Park RT and the Nicholas Mennino Trust bought the 84,000-square-foot lot in 2014 for $1.4 million. Reames, an Ohio native, studied molecular genetics at Ohio State University before receiving his Master’s of Business Administration from Franklin University in 2000. The 42-year-old entrepreneur said he started brewing beer in his garage in 2002 before searching for potential locations six years later. “Going from brewing in my garage to this, there’s really no comparison,” he said. While Bent Water can store up to 15,000 barrels of beer, Reames said his goal is to hold as many as 90,000. He said the support from the community and surrounding towns has been incredible, and was another reason for locating in Lynn. Dillon Durst can be reached at ddurst@itemlive.com.